HER: ONE Give her something sparkly she can wear year round. TWO Give the gift of cashmere. THREE She can burn this candle and think of you. FOUR Cute and comfy, always a win. FIVE A classic she will wear over and over. SIX A pretty vase to hold her flowers. SEVEN Buy them in pinks and reds. 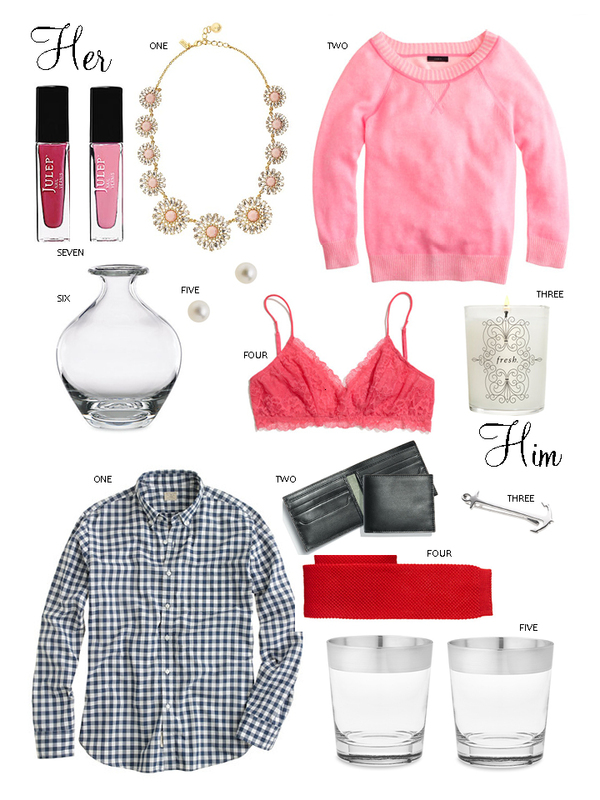 // HIM: ONE Gingham is always a classic. TWO Because you know he is due for an upgrade. THREE Playful yet mature, just like him. FOUR Keep him style with a knit tie. FIVE A silver-rimmed glasses will hold his drink, beautifully. Valentine's Day is coming up quickly, well it is actually tomorrow. Will and I choose to keep it simple. He buys me flowers, and I buy him a bottle of his favorite bourbon. But, if you wish to do something a little more fanciful feel free! So, if you are a last minute shopper herd are a few ideas for the love in your life.